Clay soil is much maligned by gardeners and homeowners everywhere, and no wonder: it’s heavy, sticky, and difficult to work in. But the simple fact is that clay soil gets its bad rap because it’s hard on people – from a plant’s point of view, clay soil is usually not problematic at all. In fact, clay soils offer plants two major advantages over other soil types: they hold water well, minimizing drought stress, and are abundant in nutrients essential for plant growth. So, if you’ve been struggling to achieve your dream garden or landscape in clay soil, cheer up! Here are ten beautiful shrubs that will thrive in clay. Sometimes known by the unfortunate name of chokeberry (thanks to its edible but astringent fruit), aronia is a beautiful North American native with multi-season appeal. Spring brings a blanket of white flowers, each dotted with bright pink pollen in the center. As summer wears on, purple-black fruits develop. Finally, come autumn, the whole plant blazes with brilliant orange, red, and yellow color. Previously, aronia was only available as a large shrub or small tree, but Low Scape® aronias make this versatile, durable species available to all with new, smaller habits. Low Scape® Mound aronia naturally grows as a tidy little tuffet, making it the perfect groundcover or edging. Low Scape® Hedger aronia has a taller but narrow habit, so it makes the perfect low hedge for landscaping or screening off air conditioners and the like. This tough species can grow in most any soil and even tolerates shade well. Most people know the tree-like white flowering dogwoods that burst into bloom each spring. Those can be a bit fussy about where they are planted, but their close cousins, the shrub dogwoods, are some of the most widely adaptable landscape plants on the market. They grow in sun or shade, in all types of soils, in wet and dry conditions, and are resistant to both deer and rabbits. Their best feature in the landscape is their colorful winter stems – red for Arctic Fire® and yellow and coral for Arctic Sun®, or, in the case of Pucker Up®, its unique “quilted” foliage. 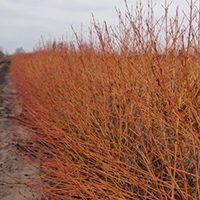 Red Rover® combines brilliant fall color, blue berries, and deep mahogany-red stems. All can be planted anywhere and relied upon for beautiful, practically effortless coverage. 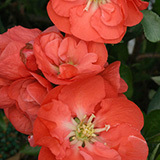 Flowering quince is an old-fashioned favorite for its very vivid spring blooms. It fell out of favor, however, due to its prominent thorns. Fortunately, Dr. Tom Ranney from NCSU developed the Double Take™ series, which has the same super saturated flower colors but in big, doubled versions and without thorns. Take your pick of four glorious shades: Double Take Scarlet™, Double Take Orange™, Double Take Pink™, and Double Take Peach™. They bloom for several weeks and often rebloom in fall. We’ve heard reports of over a month of bloom in areas as hot as Dallas, Texas, which shows how tough and durable these springtime beauties are. Everyone loves lilacs, and it must be because their fragrance is so delicate that people tend to think they are hard to grow. Surprise! Lilacs are actually extremely durable. 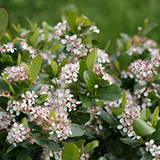 They love – nay, need – cold temperatures, making them one of the most cold-tolerant landscape plants. Plus, they are typically untouched by deer and rabbits. All one really has to do is plant them in a sunny spot and enjoy. To get the very most out of a lilac planting, look for Bloomerang® reblooming lilacs – they bloom alongside other lilacs in spring, but after a brief rest, bloom mid-summer through fall for more color and fragrance. 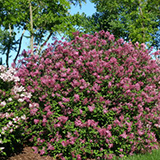 They are also highly resistant to diseases that can plague conventional lilacs, too. 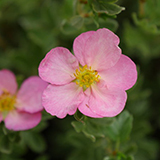 Happy Face® potentillas are about as close as you can get to a shrub that blooms non-stop. The show begins in late spring and goes, and goes, and goes, right up until the first hard frost. We selected the Happy Face series for extra-large, very bright blooms. They are nestled into a neat, mounded shrub of emerald green foliage that emerges with a snowy white coating of fine, soft hairs. Not only does clay soil pose no problems for these durable, hard-working shrubs, they are also extremely deer and rabbit resistant, too. 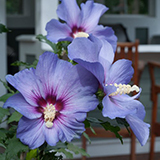 Whether you call it rose of Sharon or althea, everyone agrees that this old-fashioned favorite is hard to beat for easy-care summer color. 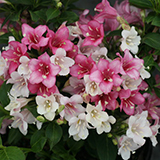 With large, saucer-like blooms for months every summer in beautiful shades perfectly suited to sunny days, its prettiness belies an extremely tough plant. It can grow in nearly any soil and needs no pruning to grow into a landscape-worthy accent or hedge. Many varieties have the liability of setting a lot of seed that spread all over the place and makes it kind of a maintenance nightmare, but our low to no seed varieties, the Chiffon® series, the Satin® series, and the Sugar Tip® series eliminate this problem, adding outstanding, pure colors and graceful habits to boot. If you’re looking for something smaller, the dwarf Lil’ Kim® series is just the ticket. Yes, you can grow hydrangeas even in clay soil! 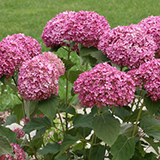 In fact, smooth hydrangeas, also known as Annabelle hydrangeas, are native to North America and grow naturally in very heavy clay soils without a problem. In addition to their ability to withstand challenging conditions, smooth hydrangeas like the Incrediball® series and Invincibelle® series bring all-new colors to this landscape standard. Better still, they all have strong, sturdy stems that won’t flop, even after summer rains, like ‘Annabelle’ notoriously does. Whether you live in the frigid North or the steamy South, you can grow these easy-care, practically fool-proof hydrangeas. With their trumpet-like flowers and late spring bloom time, weigela seem to announce the transition into summer. They do so with good-natured aplomb and the ability to take most anything nature throws at them, including tough soils. They love a good, sunny spot, which ensures best color on dark-leaf varieties like the Wine series as well as abundant blooms. For the longest bloom period, look to reblooming varieties like Sonic Bloom® or the Snippet™ series. Just pick your favorite colors, plant, and enjoy – you won’t have to worry about deer or rabbits spoiling the show.